Given that this was not Vueling Airlines maiden flight I would have thought that these two issues would have been considered when creating the flight schedule. Also there did not seem to be any imperative to actually check luggage, regardless of size or number of bags – never challenge a Vueling flight attendant to a game of Tetris. 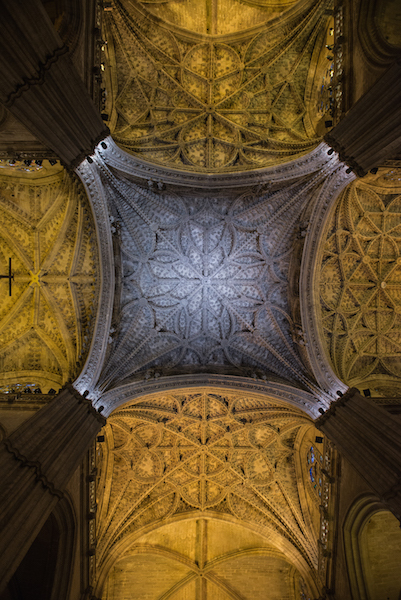 The builders of Seville can sure build a palace or a cathedral but they sure can’t plan a city. Where Melbourne prides itself on the few laneways it has hidden amongst its grid of semi major arterials, Seville has done the opposite. There are a few main roads and the rest is a web of lanes and narrow alleys. The alleys were clearly designed in the time of horses and carts as that is all that can fit. Which might be why there are so many horses drawn carriages. In other cities I would say they are quaint tourist attractions. In Seville I think the horse/carriage combination is still a legitimate form of transport. Seville has taken alfresco dining to a whole new level, so restaurants do not even have an inside. All dining is on the street…with the horses. Sevillians also love tapas. Tapas and pizza appears to be the only cuisines available, and even pizza can come in tapas size servings, that’s because everything on a menu can be served in a tapas portion size. No-one orders a main. Ordering a main in Seville would be as confusing to a waiter as not ordering fries is t o a waiter in New York. Seville is very flat, and extremely walk-able. Sure you have to wander endlessly through a myriad of intersecting lanes and through countless squares but everything is no more than 10 minutes walk from the next place to visit, and there is so many secrets to discover along the way. It is also a great way to work off the limitless tapas and wine that cost €3 a bottle (nice wine too – none of the cheap stuff). 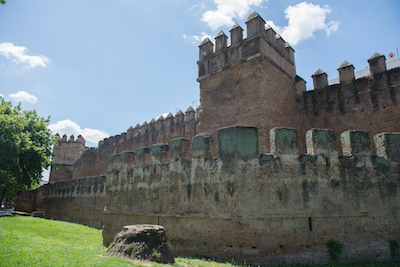 Seville was once surrounded by a wall as, as were many other European cities. It was the first line of defence against other kingdoms who might try to invade and conquer the land. Of course the wall failed, with the city ruled by the Romans then the Visgoths (German goths), the Muslims and then the Castilian Christians. There was also an internal rebellion. At best the wall slowed them down a bit. Seville’s road layout is a much better defence than any wall. Armies could get lost for hours just trying to find the palace to invade. For those considering constructing walls, learn from history. They are expensive, hard to defend and they fail. The Berlin wall, fail. The ice wall in the north, fail. The Chinese wall, fail. The last one is even considered to be a great wall…but it still failed. When walls fail they also have a tendency to signal the end for the ruler of the day. 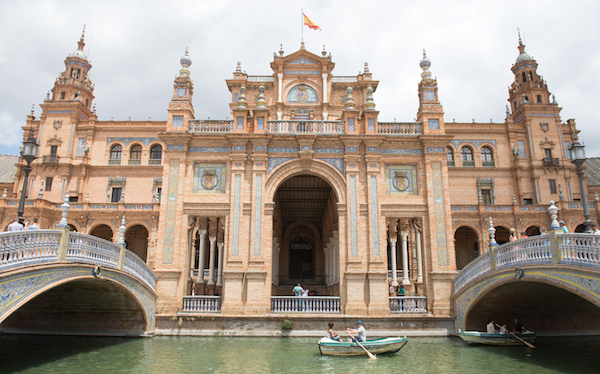 The Alcazar of Seville, the royal palace is as expansive as it is ornate. Similar to the city in which it is situated to the untrained eye the palace is a series of corridors, courtyards and rooms designed to confound guests. The palace also shows the artistic and architectural influences of rulers with Christian motifs sitting in harmony amongst Islamic symbols atop Roman pillars and arches. The designs sit in harmony together and in fact enhance each other’s beauty and elegance. 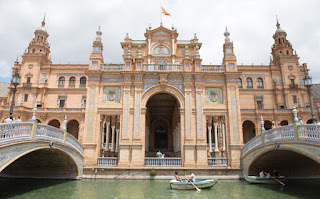 Seville is a very Catholic city, it was infamously the seat of the Inquisition. The Inquisition museum, which was the castle, or more accurately the foundations of the castle in which the inquisitors lived and the “trials” occurred. The museum really just talks about the rooms in the castle and their historic use, with only the slightest hint of the brutality and vindictive nature of the activities. None of the audio or visual display worked, and looked like they have been in a state of disrepair for quite some time. It is like Seville does not want anyone inquiring unjustly into its past. Ironic really. 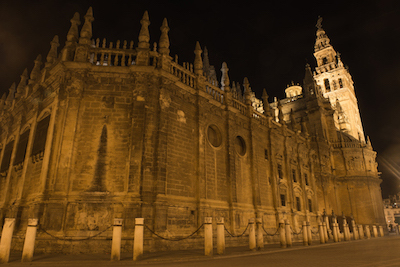 Seville does like a church and a monastery. Despite being home to the largest gothic-style cathedral (and third largest church) in the world it has a lot of other religious buildings. Maybe it was the fear of the Inquisition, where not even a personal reference from the Pope himself was necessarily enough to prove one was catholic enough. Building a church or a monastery may have just saved the lives of the architect, builder and owner. 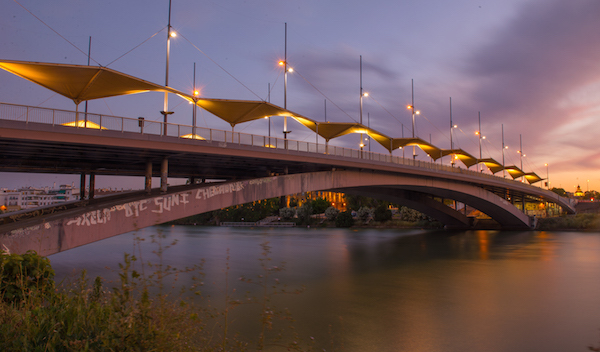 Seville is also bang up for a bridge. With a population of approximately 700,000 in a space that only take 3hours to circumnavigate on foot it has nine bridges. There is only one river and it is only on the western side of the city. Must be somehow connected to all of the horse and carts.